Dyno proven gain of 20HP and 17TQ!There are several brands out there when it comes to aftermarket air intake systems, but Injen leads the way in innovation, efficiency, and power gains. 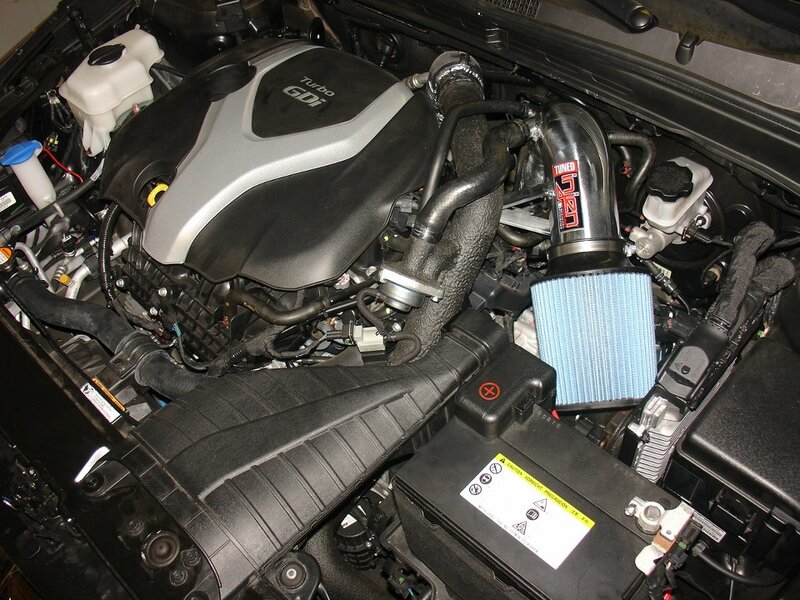 Injen Cold Air Intake Systems are more than just a high flow air filter on a less restrictive tube. Featuring Injen's patented MR Technology, Injen incorporates a step process into their intake tubes (meaning they increase or decrease the diameter of the intake tube at strategic points to control airflow). This, coupled with the fact that Injen Injen Air Intakes incorporate your existing sensors, mean you won't have any check engine lights and it is safe for use on your vehicle. This "Factory Tuned" design means you won't need any tuning and makes this truly a bolt on system. The part number for this item is SP1330P or SP1330BLK (depending on the color you chose) and it fits the 2011-2012 Kia Optima 2.0 Turbo. Technology�s HYDRO-SHIELD PRE-FILTERS are race proven material manufactured from highly durable polyester. Uniform micron openings allow the filtering of debris .005� or larger. The HYDRO-SHIELD PRE-FILTERS are factory treated using an embedded hydrophobic process, which offers consistent airflow, water repellency and maintains horsepower gains. (Please note that this item is water repellent, not water proof).